Outer hair cells mechanically amplify low-level sound that enters the cochlea. The amplification may be powered by the movement of their hair bundles, or by an electrically driven motility of their cell bodies. This so-called somatic electromotility amplifies sound in all land vertebrates. It is affected by the closing mechanism of the mechanical sensory ion channels at the tips of the hair bundles. In mammalian outer hair cells, the receptor potential triggers active vibrations of the cell body. This mechanical response to electrical signals is termed somatic electromotility and drives oscillations in the cell’s length, which occur at the frequency of the incoming sound and provide mechanical feedback amplification. 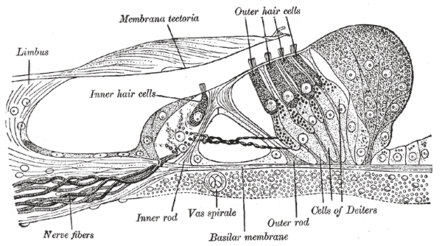 Outer hair cells are found only in mammals. While hearing sensitivity of mammals is similar to that of other classes of vertebrates, without functioning outer hair cells, the sensitivity decreases by approximately 50 dB . Outer hair cells extend the hearing range to about 200 kHz in some marine mammals. They have also improved frequency selectivity (frequency discrimination), which is of particular benefit for humans, because it enabled sophisticated speech and music. Research on the regrowth of cochlear cells may lead to medical treatments that restore hearing. 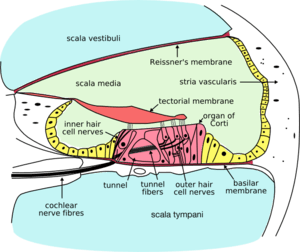 Unlike birds and fish, humans and other mammals are generally incapable of regrowing the cells of the inner ear that convert sound into neural signals when those cells are damaged by age or disease. Researchers are making progress toward gene and stem cell therapies that may allow the damaged cells to be regenerated. Because hair cells of auditory and vestibular systems in birds and fish have been found to regenerate, their ability has been studied at length. 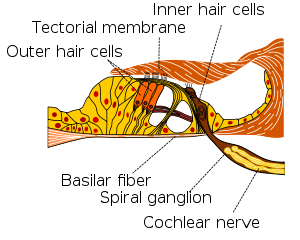 In addition, lateral line hair cells, which have a mechanotransduction function, have been shown to regrow in organisms, such as the zebrafish. ↑ Lumpkin, Ellen A.; Marshall, Kara L.; Nelson, Aislyn M. (2010). "The cell biology of touch". The Journal of Cell Biology. 191 (2): 237–248. doi:10.1083/jcb.201006074. ↑ Nadol, Joseph B. (1993). "Hearing loss". New England Journal of Medicine. 329 (15): 1092–1102. doi:10.1056/nejm199310073291507. ↑ Lush, Mark E.; Piotrowski, Tatjana (2013). "Sensory hair cell regeneration in the zebrafish lateral line". Developmental Dynamics. 243 (10): 1187–1202. doi:10.1002/dvdy.24167. PMID 25045019. 1 2 3 Cotanche, Douglas A. (1994). "Hair cell regeneration in the bird cochlea following noise damage or ototoxic drug damage". Anatomy and Embryology. 189 (1): 1–18. doi:10.1007/bf00193125. ↑ Müller, U (October 2008). "Cadherins and mechanotransduction by hair cells". Current opinion in cell biology. 20 (5): 557–566. doi:10.1016/j.ceb.2008.06.004. PMC 2692626 . PMID 18619539. ↑ Chan DK, Hudspeth AJ (February 2005). "Ca2+ current-driven nonlinear amplification by the mammalian cochlea in vitro". Nature Neuroscience. 8 (2): 149–155. doi:10.1038/nn1385. PMC 2151387 . PMID 15643426. ↑ A movie clip showing an isolated outer hair cell moving in response to electrical stimulation can be seen here (physiol.ox.ac.uk). ↑ Hudspeth AJ (2008-08-28). "Making an effort to listen: mechanical amplification in the ear". Neuron. 59 (4): 530–45. doi:10.1016/j.neuron.2008.07.012. PMC 2724262 . PMID 18760690. ↑ Santos-Sacchi Joseph; Song Lei; Zheng Jiefu; Nuttall Alfred L (2006-04-12). "Control of mammalian cochlear amplification by chloride anions". Journal of Neuroscience. 26 (15): 3992–8. doi:10.1523/JNEUROSCI.4548-05.2006. PMID 16611815. ↑ "Cranial Nerve VIII. Vestibulocochlear Nerve". Meddean. Loyola University Chicago. Retrieved 2008-06-04. ↑ Edge AS, Chen ZY (2008). "Hair cell regeneration". Current Opinion in Neurobiology. 18 (4): 377–82. doi:10.1016/j.conb.2008.10.001. PMID 18929656. ↑ Lombarte, Antoni (1993). "Damage and regeneration of hair cell ciliary bundles in a fish ear following treatment with gentamicin". Hearing Research. 64 (2): 166–174. doi:10.1016/0378-5955(93)90002-i. ↑ Whitfield, T.T (2002). 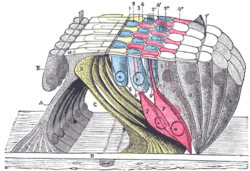 "Zebrafish as a model for hearing and deafness". Journal of Neurobiology. 53 (2): 157–171. doi:10.1002/neu.10123. ↑ Henderson M (2005-01-15). "Gene that may no longer turn a deaf ear to old age". Times Online. ↑ Sage, Cyrille; Huang, Mingqian; Vollrath, Melissa A.; Brown, M. Christian; Hinds, Philip W.; Corey, David P.; Vetter, Douglas E.; Zheng-Yi, Chen (2005). "Essential role of retinoblastoma protein in mammalian hair cell development and hearing". Proceedings of the National Academy of Sciences of the United States of America. 103 (19): 7345–7350. doi:10.1073/pnas.0510631103. PMC 1450112 . PMID 16648263. ↑ Raphael Y, Martin DM (2005). 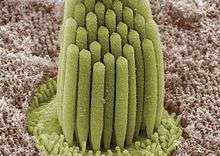 "Deafness: Lack of regulation encourages hair cell growth". Gene Therapy. 12 (13): 1021–22. doi:10.1038/sj.gt.3302523. ↑ Lu, Na; Chen, Yan; Wang, Zhengmin; Chen, Guoling; Lin, Qin; Chen, Zheng-Yi; Li, Huawei (2013). "Sonic hedgehog initiates cochlear hair cell regeneration through downregulation of retinoblastoma protein". Biochemical and Biophysical Research Communications. Elsevier. 430 (2): 700–705. doi:10.1016/j.bbrc.2012.11.088. PMC 3579567 . PMID 23211596. Rabbitt RD, Boyle R, Highstein SM (1–5 February 2010). 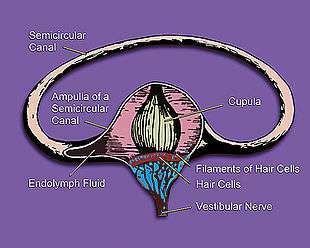 "Mechanical amplification by hair cells in the semicircular canals". Proceedings of the National Academy of Sciences. 107 (8): 3864–9. doi:10.1073/pnas.0906765107. PMC 2840494 . PMID 20133682. Lay summary.